For the European Pension Market? Pension carriers around the globe are feeling squeezed to radically change their fundamental pension systems as legislators and regulators constantly adjust the attractiveness of second- and third-pillar retirement provisions to accommodate changing demographic profiles and economic conditions. The application of these changes and requirements of the financial services industry demand a flexible and scalable solution for pension carriers’ operations, in particular their IT infrastructures, to support their daily business and reporting obligations. As a result of current low interest rates, pension plan sponsors are confronted with rising premiums and reduced profits on long-term investments. Administration costs are also increasing due to inflexible systems scattered over multiple sources that do not provide the real-time information needed in today’s market. Pension providers need to continually adjust their processes and IT systems to keep pace with market, legislative and regulatory changes. But aged and inflexible IT systems make it costly to launch new pension products, or enhance existing ones by adding individual and risk-based riders. The same also applies to implementing new regulations and legislation, such as an increasing pensionable age. Not to mention the move towards customer-centricity and individualization that motivates employers to provide self-service kiosks to members which provides consumer access to the whole EU through electronic distribution channels. Are you interested in a well-engineered and modern end-to-end solution for the financial services industry with specific enhancements for the insurance and pension fund segments? We can help you implement solutions that have the scalability to accommodate the growing pension market and the capacity to respond to internal and external changes affecting the delivery of customer value in an efficient and cost-effective manner. With functionality that includes complete account histories, complete and transparent retention of all journal entries, and the ability to precisely perform retroactive changes (undo/redo), SAP for Insurance provides important capabilities for the business departments that are typically not used by pension carriers today. The solution employs modern technology with a component-based architecture, a centralized product development for cross-platform distribution, and powerful tools for straight-through processing and data migration. The state-of-the-art, open architecture of SAP fully supports the orchestration and automation of process-flows and enables providers the ability to optimize their operations. As a strategic partner of SAP, msg global solutions provides deep pension-market expertise and offers several add-ons to the SAP for Insurance solution that have been designed specifically for the European Pension Market. Financial Services Accelerator for the SAP Digital Portal Technology facilitates multi-channel marketing requirements in conjunction with commerce requirements, including a common base for any offer calculation out of the core administration in the mid- or back-office. With this portal technology, SAP fully supports the focus on customers, whether they’re employers, employees, or even brokers. Pension administration with SAP for Pension is the answer to manage particular pension products and processes for regional markets with a high degree of automation. Administer DB and DC products at the same time within the same instance. Each product can be maintained separately in cases of different portfolios, but it is even possible to offer hybrid DB/DC products. With the life insurance kernel of SAP, it is, of course, possible to add typical risk-based coverages to the saving part of a pension. Analytical risk and performance components were developed by msg global solutions especially for the Dutch Pension Market. The new APF initiative, including ring-fenced administration and reporting, as well as special features, like continued investing (“Doorbeleggen” = by investing), are built into the solution. SAP can facilitate multiple development teams in a multi-product, mixed-requirements agile environment to get the best out of their skills and achieve optimal results. The pension market is constantly evolving, and pension administrators must have the tools to get new products to market quickly. msg global solutions has developed a tailored product configuration that uses a building-block approach to increase time-to-market and easily convert product testing into product management. Products in the msg product engine are assembled by using “building blocks” — reusable, granular components that are used to compose new products. This means that when a product behaves in a similar way as an already implemented product, only the delta needs to be built. The main administration module for pension operations is Policy Management. Calculation queries from Policy Management are passed to the Product Engine. Both applications are tailored for a fast time-to-market of new products. Standard business transactions can be assigned to a product in the In-Force Business Configurator using a building-blocks approach. The Product Module Group customizing allows the configuration of different process behaviors for a group of products at the same time. By assigning the new product to an existing group, all configuration for that dimension is automatically set. In combination with the assignment of business transactions to a product in the In-Force Business Configurator, an integrated building-block approach is established for a fast time-to-market of new products. msg global solutions can help you develop a solution platform to manage your pension products. Our template approach allows you to cater to different market segments from individual to group pension plans, both in your domestic as well as international market — all provided by a single platform. As different as pension vehicles and carriers might be from a legal perspective, our solution is tailored to support this variety while enabling the reuse of common functionality. We can easily accommodate different legal entities with the obligatory separation of customer data and accounting information. 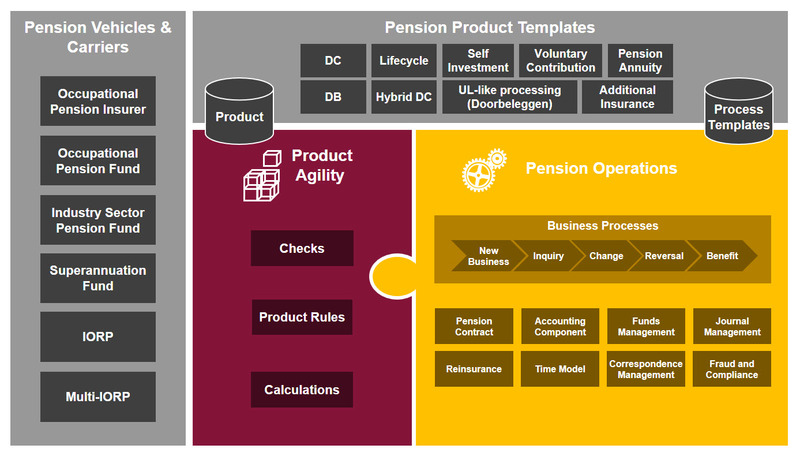 The configuration of pension products in the product engine follows our comprehensive template approach, which enables reuse across products as well as markets. You maintain common characteristics and functionality of your pension products in one spot while having the flexibility of individual enhancements to your particular market demands. By defining pension products at the granular component level, your product checks and rules, as well as their calculations will be modeled in easily maintainable and re-usable blocks. 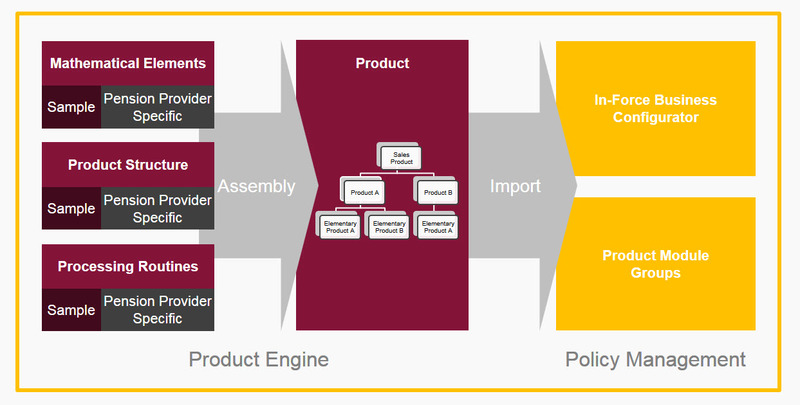 But most important, everything is maintained in one central place, the product engine. This central product repository enables you to improve your product agility with quicker product releases and gives you more flexibility to tailor pension products for specific customer groups. With SAP for Pension at the heart of your pension operations, a high level of process automation will become your standard. Working with process templates will efficiently support your entire pension portfolio. Whether you scroll through contract versions of the past, perform current or backdated business processes or plan future activities, your contract information remains consistent at all times. Providing a perfect basis for your digitalization path. 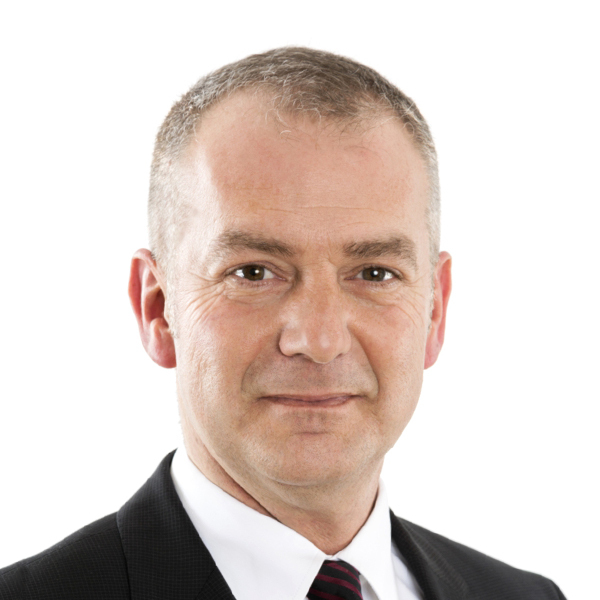 As an SAP strategic partner, msg global solutions has already established region- and country-specific responses to the demands of the ever-changing pension industry. Below is a select example of recent implementation highlights. Contact Robert to learn more about how msg global solutions can help you design a scalable, flexible pension management solution.